My Occasional Blog: Why Olympus? My Olympus kit. Two E-P5 bodies with VF4 viewfinder, 25mm f1.8 lens, 75mm f1.8, 45mm f1.8, 12mm f2 and small Olympus flash. One of the questions I've gotten since my switch to using Olympus gear for my day to day go to cameras is why Olympus? Why not Sony, Samsung, or, especially, Fuji? Photographers buying gear now have a wealth of choices. The most interesting things coming out in the photo industry right now are in the mirrorless realm. Olympus/Panasonic (they collaborate on Micro 4:3, Panasonic lenses work on Olympus bodies and vice versa) have been promoting Micro 4:3 for about five years now. Sony has jumped on the mirrorless bandwagon in a big way and has multiple choices in multiple formats. Fuji has captured photographers' imaginations (and wallets) with state of the art technology in very well received, wonderfully retro, bodies. Samsung, the TV maker and mobile phone copier, has jumped into the deep end of the photography pool with their new digital bodies. I ended up with Olympus and Micro 4:3 for several reasons. 1) Micro 4:3 was the first mirrorless system to get significant public acceptance. * Olympus and Panasonic have been designing and introducing M4:3 bodies and lens for a long time and the system is the most mature, with the greatest number of native lenses** and selection of bodies. If you want a fisheye lens, there's the Panasonic 8mm fisheye. If you want a telephoto lens, Olympus has a 75mm - 300mm zoom. Because of the 2X crop of M4:3 this lens is like using a 150mm to 600mm on a traditional "full frame" body. 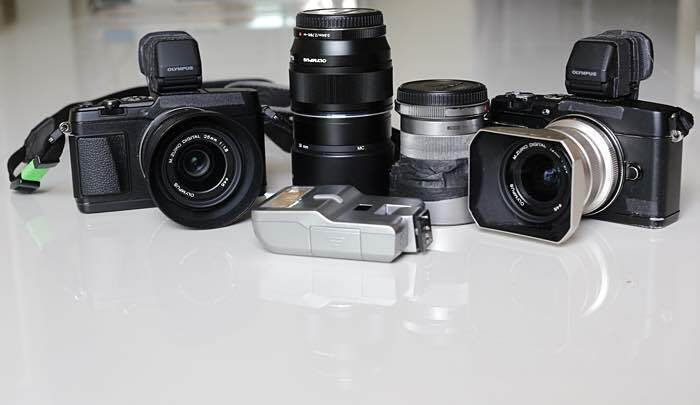 Panasonic has an excellent mid range zoom in the 12mm - 35mm zoom and Olympus has professional caliber zooms in the excellent 12mm - 40mm f2.8 zoom and well reviewed 40mm - 150mm f2.8 zoom (remember that because of the 2X crop of M4:3 this lens is like using a 80mm - 300mm f2.8 zoom on a traditional "full frame" body). At about $1500 (US) this lens is not cheap, but a Canon or Nikon 300mm f2.8 lens will set you back about $6500, so $1500 doesn't seem so bad. I use prime lenses exclusively, especially with M4:3 and I'm not likely to buy the zooms, but the M4:3 makers already have a nice set of primes with more lenses in the pipeline. 2) I made this switch because I wanted something smaller, lighter and easier to carry. M4:3 is the smallest sized sensor of the group, which means it has the smallest bodies and especially lenses. Sony, for example, has some very well received full frame mirrorless bodies in their A7 series. The bodies are not much bigger than the E-P5 body. But since they're full frame (sensor size is 24mm X 36mm), their lenses are essentially the same size as Canon or Nikon lenses for traditional dSLRs. E-P5 with the 25mm f1.8 lens next to my 5D Mark III with the 50mm f1.2 lens. The same thing applies to Fuji and Samsung lines. They use an APS sized sensor, which, with a 1.5X crop, is sort of midway between "full frame" and M4:3. Their lenses are a little smaller than CanNik lenses but not as petite as M4:3. Lens size is one of the reasons I use prime lenses instead of zooms. The Olympus 12mm - 40mm f2.8 zoom is tiny compared to either the Canon or Nikon 24mm - 70mm f2.8 zooms, but compared to the Olympus primes it's a handful. 3) I've been working with M4:3 gear since 2010. I was searching for a more capable replacement to my Canon G series point and shoot cameras at that time and M4:3 intrigued me. I've been selectively adding M4:3 gear to my kit piecemeal through the years. Switching to Micro 4:3 was less costly than switching to another format, which would have required buying a couple of bodies, a set of lenses, flash, batteries (I have eight batteries for the E-P5) etc all at once. 5) Muscle memory. I've been using M4:3 for a while now. I can change camera settings, change lenses and memory cards with my eyes closed. It's what I'm comfortable with and why I insist on having identical camera bodies. * I'm not including Leica, which live in a universe of their own, in this discussion. ** By "native lenses" I mean lenses designed to work with the bodies. 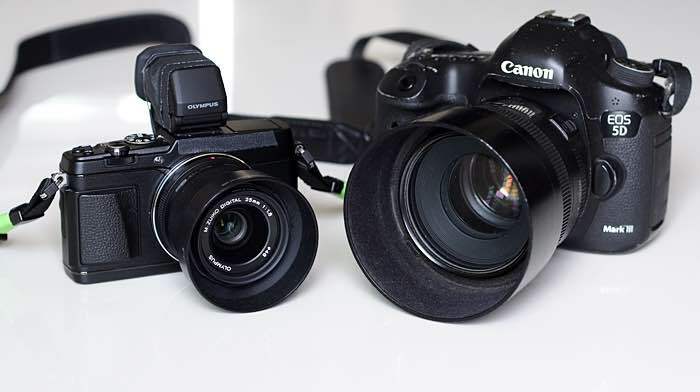 Because of the way mirrorless bodies are designed, most of them can accept a huge number of lenses from almost any maker through the use of adapters. Most of these adapted lenses lose their electronics interface and so won't autofocus or use autoexposure. *** All of the mirrorless manufacturers want bragging rights for the title of fastest camera. Before settling on Micro 4:3 I tried the Fuji X series and some of the Sony bodies. At the time that I tried them, they were substantially slower than the M4:3 gear I was using. Both Fuji and Sony have worked very hard to improve the autofocus speed and responsiveness of their bodies. The experiences I had two years ago, the last time I tried either Sony or Fuji, may not be applicable now. I have no experience at all with Samsung.